The present disc affords an opportunity to hear four most rewarding works by a leading American composer who has collaborated in their production with librettist and veteran cardio-thoracic surgeon of 40 years’ practice, Myles Lee. This series of four instrumental concertos pays tribute to four of the greatest Presidents of these United States, namely George Washington, Thomas Jefferson, and the two Roosevelts, Theodore and Franklin Delano. The first concerto, entitled Soul of a Nation, is an encomium to Jefferson, and is scored for violin and string orchestra. It opens with an extended unaccompanied solo exquisitely performed by violinist Frank Almond. Shortly into the piece, the narrator, Fanfare’s own Henry Fogel, begins a disquisition on our third President, Myles Lee’s text focusing on Jefferson’s authorship of the Declaration of Independence and his idea that independence, religious freedom, and education formed the soul of a nation. The narration is largely confined to solo utterances, with the violin and string ensemble effecting a musical commentary on the words. Given the turbulent time this work is portraying, the music is sometimes turgid and dissonant, but at other times sweetly lyrical. Violinist Almond is clearly a master of his instrument, and the string orchestra of Roosevelt University also plays at a consistently professional level. Fogel, incidentally, is the recently retired Dean of the Chicago College of Performing Arts, which is part of Roosevelt University. His narration proves him to be as effective a speaker as he is a writer, which is saying something. The Indispensable Man paints a portrait of FDR, and opens with a jazzy lick on the solo clarinet; indeed, the music of this Concerto is evocative of the Swing Era, and its prime clarinetists, Benny Goodman and Artie Shaw, whose music helped a war-torn nation survive the traumatic ordeal. Unlike the format of the preceding concerto, the narration in this one is often undergirded by music. I’ve previously praised in print the clarinet playing of John Bruce Yeh, and now I know why. Not only is he a member of the Chicago Symphony Orchestra, but he is the longest-serving clarinetist in the orchestra’s history, having been in his position since 1977. As in the first Concerto, Bond skillfully varies the style of the music according to Lee’s text at the moment. At some points, I discern hints of a martial character suggestive of the then-ongoing worldwide conflagration. David Holloway is also a very effective narrator for the text, and he is as different from Fogel in sound as the clarinet is from the violin. Following is The Crowded Hours, which portrays Theodore Roosevelt, whose personality was imbued with optimism, high energy, and enthusiasm. It opens with a prolog that hearkens back to the spirit of the times through hints of various patriotic songs of the Bull Moose era. These are not quoted at any length, but fragments are combined in clever Ivesian polytonal fashion to suggest rather than overtly state them. The virtuosic solo part, performed by another member of the CSO, trumpeter Mark Ridenour, is dashed off with aplomb. Here again, the narration is largely unaccompanied or, at most, sparsely accompanied. The brass members of the Chicago College of Performing Arts are on display here, and the tight ensemble is kept that way by conductor Stephen Squires. Bond makes a touching reference to Roosevelt’s loss of his son Quentin as a casualty of WWI through a brief reference to Taps. This loss caused Roosevelt a good deal of grief, from which he never fully recovered, dying a mere six months after his son. Pater Patriae commemorates George Washington. If I remember my 9th-grade Latin at all (pretty iffy after fifty-plus years), the phrase means “father of the fatherland.” Its introduction again strikes a patriotic outlook and contains once again martial elements, with a backwards glance to the drum and fife corps of the time. There is an unmistakable reference to Yankee Doodle in this introduction as well, and I admit that the corners of my mouth bent upwards when I heard it, as they did several times earlier in the work. In this Concerto, the solo instrument is the flute, the part superbly rendered by flautist Gabriela Vargas, another Chicago area performer who has won several competitions. Despite the optimistic tone of the music in much of this movement, Bond also provides music of a more sober nature. After all, the continuation of the new nation over which Washington presided was by no means secure in its first several decades. 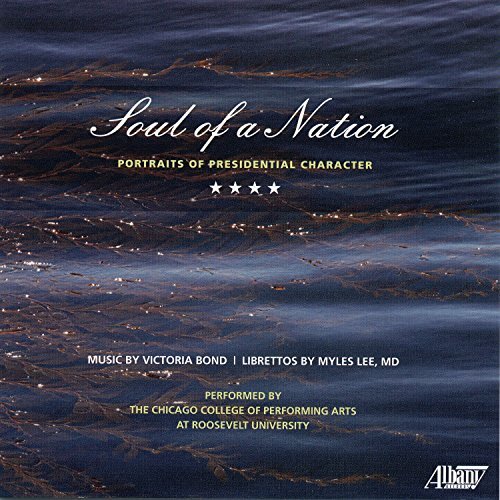 Myles Lee does an excellent job in his distillation of the essence of these four Presidents in his texts, and Bond does an equally admirable job in her building of the musical pedestal upon which these texts are presented. I give high kudos to all of the soloists (which especially include the four narrators) for bringing these works to life in a most vivid fashion. This CD is outstanding in every parameter, and I believe the great majority of Fanfare’s readership would find this disc a worthwhile, and even essential acquisition. Older PostWinnipeg Free Press reviews"Ragtime in Washington"